New Zealand mountaineer Edmund Hillary and his Nepalese Sherpa guide Tenzing Norgay made headlines in 1953 when they became the first team to successfully reach the summit of Mount Everest. It was a ground-breaking expedition that killed many before them and has killed many since. Today, Mount Everest is an industry. More than 4,000 people have scaled its summit, many setting records that include an 80-year-old man from Japan, a 15-year-old boy from the US and blind adventurer Erik Weihenmayer. A few have even done it without supplementary oxygen. By the late nineties, Mount Everest was a major destination for adventure seekers. It averages 150,000 visitors every year, with hundreds attempting to climb the mountain at a cost that can exceed $100,000. But not everything that goes up Mount Everest comes down. 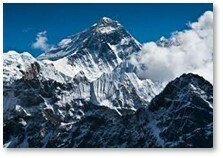 Decades of commercial mountaineering have turned Mount Everest into the world’s highest garbage dump. As the number of ascents increases, so does the amount of garbage and human waste left behind. Melting glaciers caused by global warming are exposing trash that has accumulated on the mountain since Hillary’s summit 65 years ago. 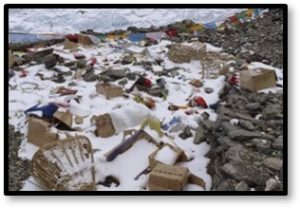 Plastics, tents, oxygen tanks, and over 200 corpses of past climbers are scattered across the mountain’s slope. Visitors produce about 12,000 pounds of human waste each year, which remains on the mountain or ends up in waterways that local villages rely on. Since 2015, officials in Tibet have given every climber two trash bags to retrieve at least 8 kg/17.5 lbs. of garbage, levying a fine of $100 for each kilogram by which a climber falls short. Nepal adopted a similar rule requiring a $4,000 deposit per team; refunded if each climber brings down at least 18 pounds of waste. In 2017 climbers brought down 25 tons of trash and 15 tons of human waste but many opted to forfeit the deposit, which is a drop in the bucket compared to the cost of the experience. Climbers say collecting trash is just as demanding as tackling the summit since it is a strenuous task that boosts the consumption of oxygen they need to breathe. Trash is managed by the Sagarmatha Pollution Control Committee (SPCC), a nonprofit and nongovernment organization that cleans and maintains several climbing routes. They have installed over 70 trash containers along trails and provide door-to-door garbage collection in larger villages. Sir Edmund is believed to be the first to reach the peak of Everest (though some believe it was George Mallory) but he was not the first to try. Today around 800 people attempt the climb annually. 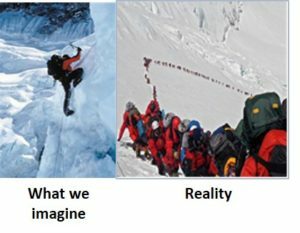 Since Hillary’s victory 4,833 different people have summited Everest, some multiple times, for a total of 8,306 summits. Over 400 of them are women, and as of 2017, 378 people have died attempting the climb. We envision the ascent on the mountain as a lone climber up against the unrelenting assault of Mother Nature, struggling to reach the peak at 29,029 feet above sea level. For the best of them, there is truth in that image—a superhuman achievement against incredible odds. For the rest of them, it’s a very expensive field trip. The Chinese permit fee is $9,500, and Nepal charges $11,000, followed by the $25,000 – $30,000 cost of the actual climb, for a starting price of around $45,000. Not included in that estimate are out-of-pocket expenses for training, climbing gear, medications, and the $2000 plane ticket. As a level set, climbers usually have two pairs of gloves that average $300 each. Because of the high cost, climbers range from sponsored athletes to wealthy men in their forties crossing an item off their bucket list. Even with those qualifications, increasing numbers of people attempting the climb each year create a major garbage crisis. Climbers used to carry their own gear but now Sherpas, the unsung heroes of every climb, along with high-altitude guides and local workers, carry heavier items like tents, extra oxygen cylinders and ropes up the mountain and down again. But most of it is abandoned on the slopes, along with unmanaged human waste. Environmentalists are concerned that the pollution on Everest is also affecting water sources in the valley. The raw sewage from base camp is carried to the next village, a one-hour walk, and dumped into trenches where it is flushed into the river during the monsoons. Mining trash for artistic treasure is nothing new and Everest’s trash is no exception. Sixty-five porters and 75 yaks labored over two years to bring more than eight tons of trash, including remnants of a crashed helicopter, down the slopes of Mount Everest to local artists. 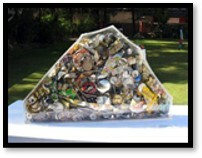 The Nepali collective of Da Mind Tree has transformed 1.5 tons of garbage into 75 sculptures. In 2007, a Maine artist collected empty oxygen bottles and turned them into bells, bowls, and ornaments. The Everest Summiteers Association, which has also collected tons of debris from the mountain, estimates there might be as much as 10 tons of trash left on Everest. That number will grow as the allure of summiting the world’s tallest mountain continues to beckon. Mallory died on his third attempt to conquer the mountain and speculation remains that he reached the summit three decades before Sir Edmund. His body was found in 1999 but offered no proof either way.